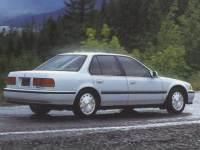 ...93 Honda Accord. New tires, new starter, new alternator. 224,000 miles, runs good. ...I have a 93 4 Dr Honda. Not pretty but runs good.